ჰიპოკამპუსი (სახელი ეწოდა ზღვის ცხენთევზასთან მსგავსების გამო, ბერძნული ἱππόκαμπος — „ცხენთევზა“. ἵππος hippos — „ცხენი“; და κάμπος kampos — „ზღვის ურჩხული“) — ადამიანისა და სხვა ხერხემლიანების თავის ტვინის მთავარი კომპონენტი. ადამიანებსა და სხვა ძუძუმწოვრებს ორი ჰიპოკამპუსი აქვთ, თითო-თითო ტვინის თითოეულ ნახევარსფეროში. ჰიპოკამპუსი მიეკუთვნება ლიმბურ სისტემას და მნიშვნელოვან როლს თამაშობს მოკლევადიანი მეხსიერებისა და გრძელვადიანი მეხსიერების ინფორმაციების გაერთიანებაში, აგრეთვე სივრცულ მეხსიერებაში, რომელიც ნავიგაციას ხდის შესაძლებელს. ჰიპოკამპუსი მდებარეობს დიდი ნახევარსფეროების ქერქის ქვეშ (ალოკორტიკული), ხოლო პრიმატებში — შუა საფეთქლის წილში. იგი შედგება ორი ძირითადი, ურთიერთდაკავშირებული ნაწილისგან: ამონის რქისა და დაკბილული ხვეულისგან. ↑ Martin, JH (2003) "Lymbic system and cerebral circuits for emotions, learning, and memory", Neuroanatomy: text and atlas, third, McGraw-Hill Companies, გვ. 382. ISBN 0-07-121237-X. 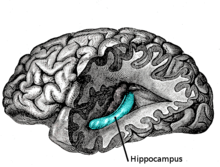 ↑ Amaral, D; Lavenex, P (2007) "Hippocampal neuroanatomy", The hippocampus book, first, New York: Oxford University Press, გვ. 37. ISBN 978-0-19-510027-3. ↑ Anderson, P; Morris, R; Amaral, D; Bliss, T; O'Keefe, J (2007) "The hippocampal formation", The hippocampus book, first, New York: Oxford University Press, გვ. 3. ISBN 978-0-19-510027-3.
ეს გვერდი ბოლოს დარედაქტირდა: 21:36, 29 იანვარი 2018.